Mount Indrakila, in the mighty Himalayas, was a tranquil abode to many sages who conducted prayers and performed severe penances the gods. One day, the sages saw a stranger walking towards their abode. They noticed that even though the stranger was wearing sage’s saffron clothes, he looked nothing like one. He was tall, well-built and was carrying weapons. On seeing the golden hilt of the sword, they recognized the stranger to be the Pandava prince, Arjuna. Arjuna walked silently to a secluded spot and sat down to make a lingam from mud to perform severe penances to Lord Shiva. He didn’t stop his penance for anything. After a few months, the earth around him was unable to bear the heat of his penance and started emanating black smoke around him. The smoke spread throughout Mount Indrakila, and the sages fled to Mount Kailash. Goddess Parvati asked him, “Why is Arjuna performing such severe penance?” He replied, “Because he wants blessed weapons for the impending war.” She still had her doubts and asked, “Do you believe that he will use the weapons wisely and judiciously?” “Well, we will have to find that out,” he replied. Lord Shiva told her about his plan to test Arjuna. He disguised himself as a Kirata Chief (Kirata is a clan of mountain dwellers), and asked Goddess Parvati and some of his followers to dress up as Kirata women. Lord Shiva took an aim at the demon with his bow and arrow, but the demon sensed the presence of Lord Shiva and fled. Lord Shiva chased him to the sage’s abode, and as soon as the sages saw the boar charging towards them they started running, screaming for help. Both shot their arrows at the boar. As soon as arrows pierced, the animal resumed its original demonic self and died. The Kirata women watching the demon fall down to his death, started dancing and celebrating. But it was not clear who had struck the boar first, and neither party was ready to concede defeat. The Kirata women argued, “He is lying, O chief! You killed the boar before him.” Arjuna did not like to be insulted so challenged the Kirata chief for a duel. Soon, arrows started flying between Arjuna and Lord Shiva. They hurled their best arrows at each other, but neither of them was hurt. Suddenly, Arjuna realised that his quiver of arrows was over. Lord Shiva smiled at him and offered, “You can borrow some arrows from me.” Hearing this, the Kirata women started mocking Arjuna. Arjuna angrily threw his bow at the hunter, who caught it, tore the string and flung it away. Not able to control his anger, Arjuna took his sword, and charged him with all his might. The sword dissolved into flowers as it struck the hunter. Everyone was surprised to see the miracle, and the Kirata women cheered their chief. Refusing to lose, Arjuna picked up a tree with his bare hands and hurled it at the hunter, who dodged it easily. Unable to concede defeat, he decided to pray to Lord Shiva for strength. He sat down in front of the lingam and started chanting “Om Namah Shivaya” and placed a garland on the lingam. Soon, he felt strength infuse his body. Happy that his prayers had been heard, he turned towards the Kirata hunter and said, “Load Shiva had blessed me with strength. Come, let’s see who wins now.” But as he saw the lingam was lying around the hunter’s neck. 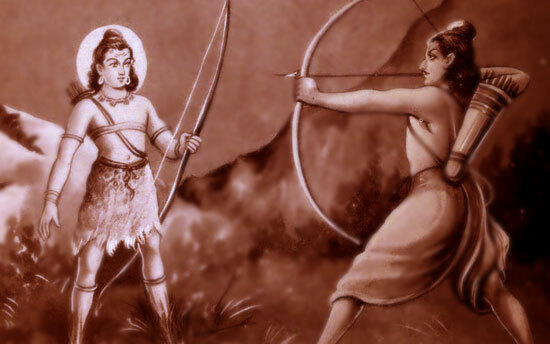 Years later, during Mahabharata, Arjuna used the Pashupata arrow to defeat Karna.